The MLS Playoffs recently kicked off as two teams Sporting KC and the Vancouver Whitecaps have already been eliminated in the knockout round. Just 8 teams remain in their quest to win the MLS Cup as the top MLS tickets this week feature Western Conference Semifinals and Eastern Conference Semifinals games as these matchups will determine who will advance to the Conference Championship. Below are the top 5 MLS tickets of the week, according to TicketIQ. The New York Red Bulls finished the year as the number 4 seed in the Eastern Conference and have advanced to the semifinals after dispatching the defending champs Sporting KC in the knockout round. The Red bulls will now prepare for two meetings with DC United as the winner will move on the Conference Championship. DC United will host the second leg of this matchup at the RFK Stadium this Saturday in Washington D.C. DC United tickets for this game have a current average price of $99.92 with a get in price of $49. The LA Galaxy finished the regular season as the number 2 seed in the Western Conference and will face off with Real Salt Lake in the semifinals. The LA Galaxy will host the second meeting on November 9 at the Stubhub Center, winner moves on to the Conference Championship. Galaxy tickets for this game have a current average price of $93.88 on the secondary market with a get in price of $36. DC United is the next obstacle for the New York Red Bulls as they will host DC United at Red Bull Arena in Harrison, New Jersey. 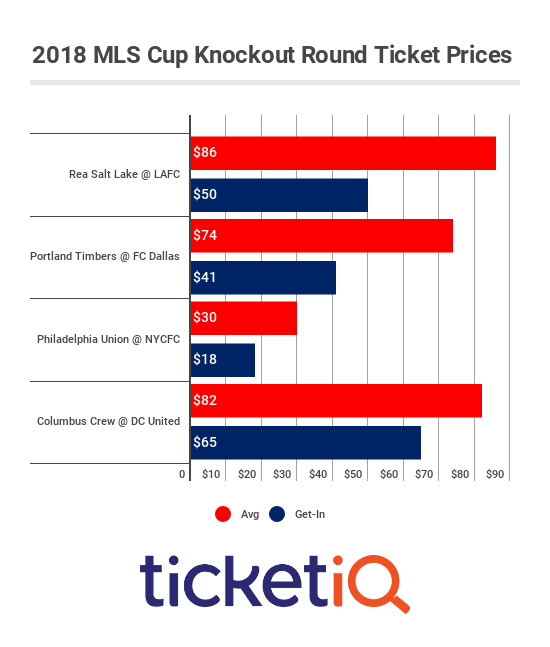 Red Bulls tickets for this game have a current average price of $88.96 on the secondary market with a get in price of $50 as tickets are now down 50% over the past week. The Seattle Sounders enter the playoffs as the number 1 seed in the Western Conference and will take on FC Dallas in the semifinals. Dallas FC defeated Vancouver in the knockout round as they will host the first leg with Seattle at Toyota Stadium. FC Dallas tickets for this game have a secondary average price of $78.69 with a get in price of $37. Columbus Crew and the New England Revolution finished the regular season as number the 2 and 3 seeds in the Eastern Conference respectively as they will not meet each other twice in the semifinals. The Revolution will host the second leg on November 9 at Gillette Stadium. Revolution tickets for this game have a current average price of $59.88 on the secondary market with a get in price of $29 as tickets are now up 12% over the past week.